Thanks for a great dig - been a while, nice to see some old faces and some new ones too. Nice easy walking and digging despite the cold, plenty signals between the interference. Eilidh had a brilliant time on her first dig detecting but unsurprising the cold got the better of her by lunchtime, but delighted making a couple of finds herself. I ended up with 2 bits of silver - a wee bit which clutching at straws could be a fragment of a merk - hard to see in photos but I'm sure there is a faint corner of a shield shape. The other bit is paper thin and shaped into a pocket, some sort of chape? Popped my hammered cherry today! Thanks for Jim the GasMan & Stuart for identifying it as an Alexander III penny, Berwick mint, circa 1250. Obverse is worn away, unfortunately. Congratulations! I heard about it but had left by that point I'm afraid, would have been great to see. One you will always remember! A fair bit of digging then, well done on the silver. Glad Eilidh enjoyed the day. Thanks for Jim the GasMan & Stuart for identifying it as an Alexander III penny, Berwick mint, circa 1249. Obverse is worn away, unfortunately. That is a a lot of targets , well done. For clarification you thought that coin was a turner I merely wiped away some dirt and notified you it was a hammered coin your face was a picture. Stuart done the real identification. You will always remember the first hammy. My finds for today three worn turners, a faceless halfpenny, the usual dross and lead. Best find was a 1921 sixpence donated to Eilidh for braving the cold she was well pleased. Wash it before you bin it, cos you never know! Well done on getting your first Hammered. Your face was a picture when told what the coin was. Hope you get many more in the future. Well done on your first hammy .. and a Scottish to boot ! Good day's digging all round .. pity about EMI but still managed 13 turners .. bit of history on that field in the 1600's for sure . 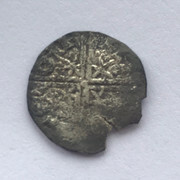 Well done with finding your first hamered silver coin. We don't find too many Scottish hammered coins so it's a good one to start with. Well done with the Hammy. 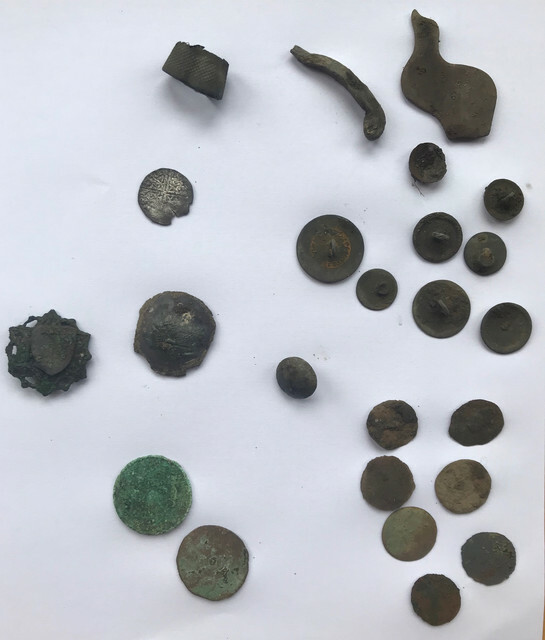 My finds all poor quality - George ll halfpenny, 5 Turners, five buttons one of which is a Livery type with Griffin holding axe under a crown. Also one musket ball with sprue still attached. Many small pieces of oxidised lead and the usual mastitis tubes. I enjoyed my day and feels good to be back hoovering the fields and I'm looking forward to next weekend.